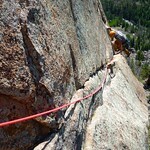 Great objective for a half day of technical quality crack climbing. 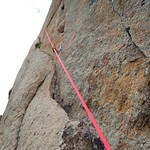 Dow had arrived in the Estes Park area the evening before, so to kick off our trip together, we climbed the route Days of Heaven on Rock of Ages. Dow's friend Tristan joined us as well for a team of three. 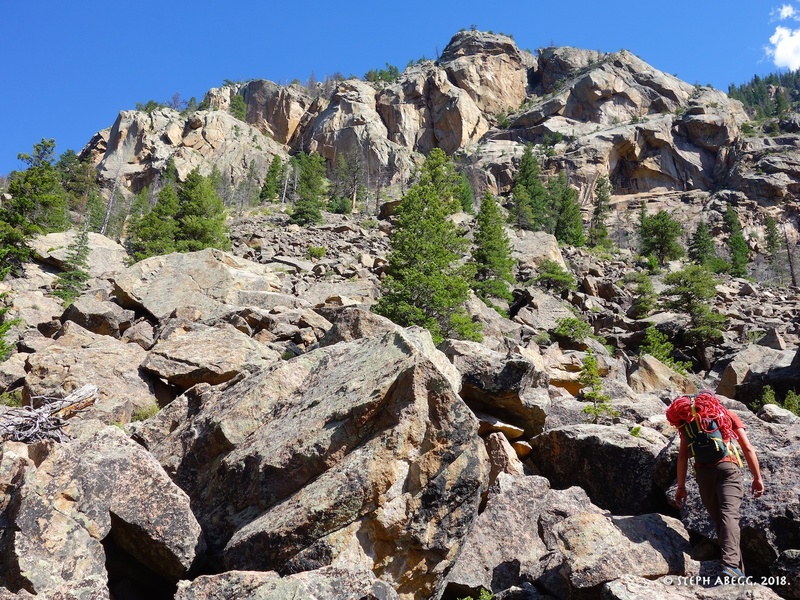 Rock of Ages is a 200-foot granite wall in Rocky Mountain National Park, with a lower elevation and shorter approach than peaks further into the park. 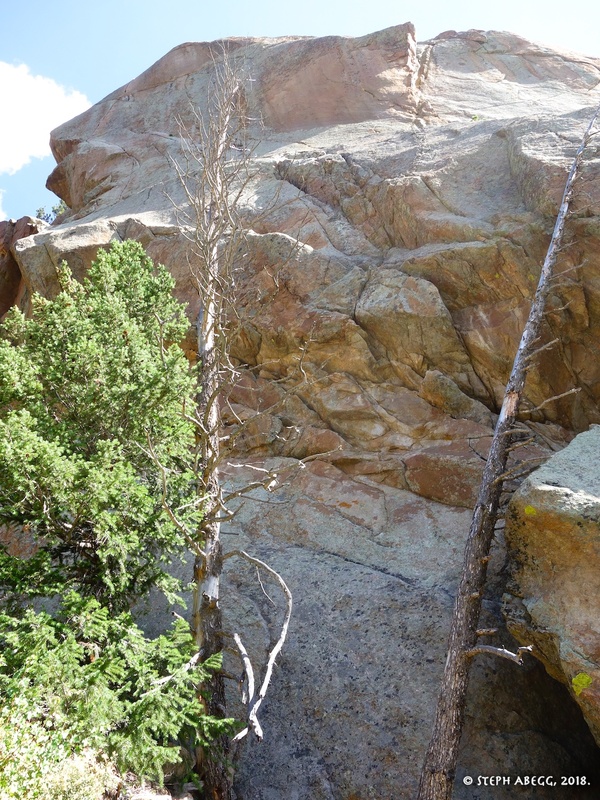 This area is a good choice for a half day or a day with possible thundershowers, or when you want to crag on a harder (5.10 or higher) route, or both. 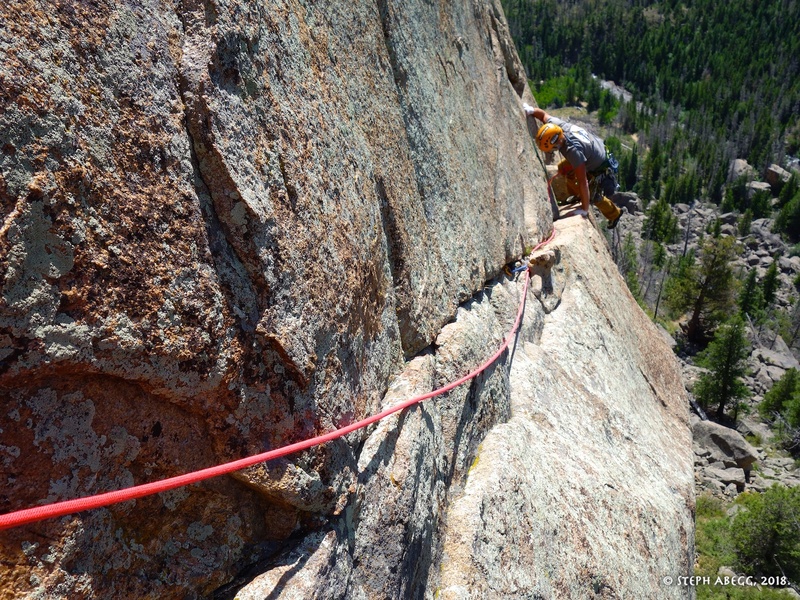 Days of Heaven — which climbs the left side of the main buttress of Rock of Ages — is perhaps the best route in the area, featuring clean splitter cracks from fingers to hands, with some wild 5.10 moves to access these cracks. I led the first pitch, while Dow led pitches 2 and 3 as a single pitch, and Tristan enjoyed the opportunity to follow the route. The first few moves of Pitch 1 pulling over the bulge are rather committing, but on cool juggy features. 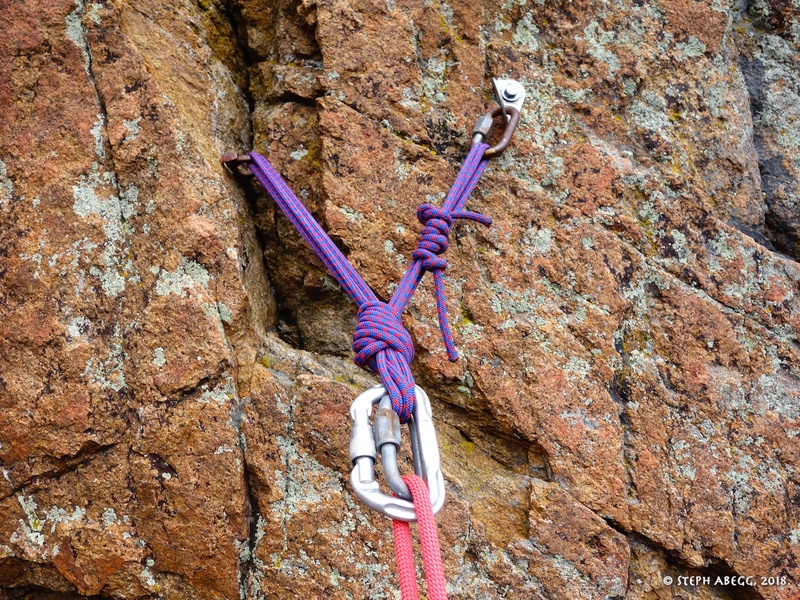 Pitch 2 is a very technical pitch, involving some face climbing and hand traversing. 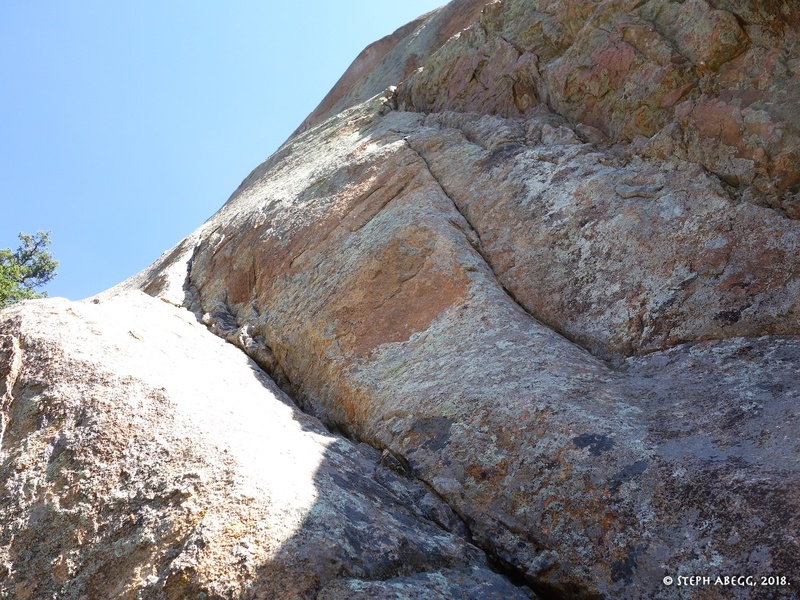 Pitch 3 is the money pitch of the route, up an obvious vertical splitter to the top. The pitch ratings seemed a bit off to us. Pitch 3 (10d) is the supposed crux pitch of the route, but actually seemed to be the most straightforward climbing, with great jams and locks; to me, Pitch 3 felt easier than Pitch 1 (10a), which had some committing and more insecure moves. 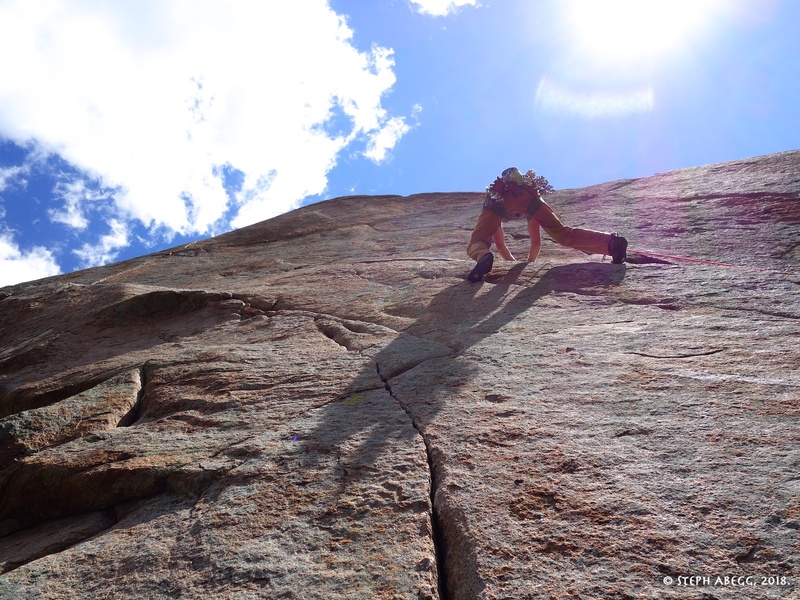 Pitch 2 (10c) was definitely the hardest pitch for us, as it felt significantly more technical and tricky than any other section of the route — specifically, the step left at the end of the hand traverse was the crux move of the route for each of us. Even though only 200 feet long, Days of Heaven was a satisfying objective for the day (plus, it began to thunder and spit droplets of rain just as we topped out, a sign that it was time to head out). 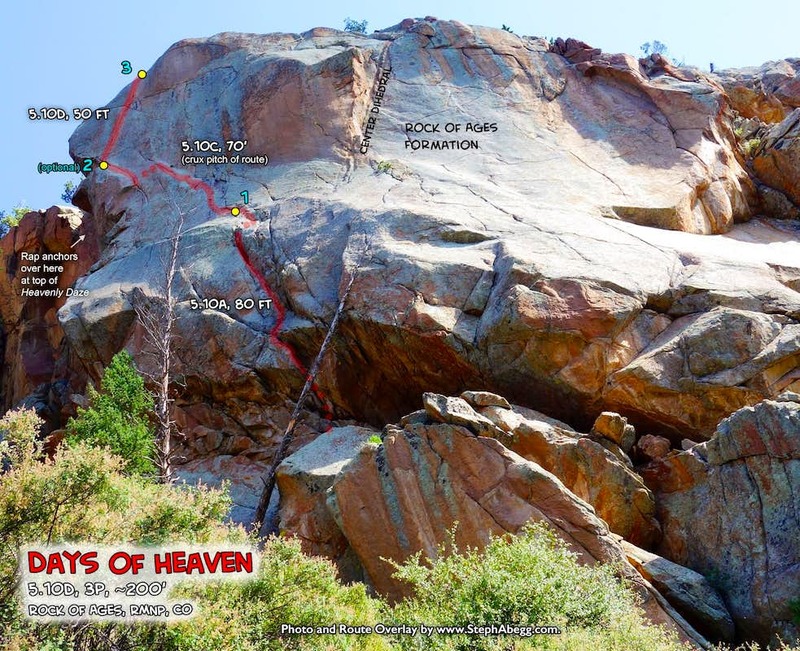 This page gives a route overlay and some photos from the climb. 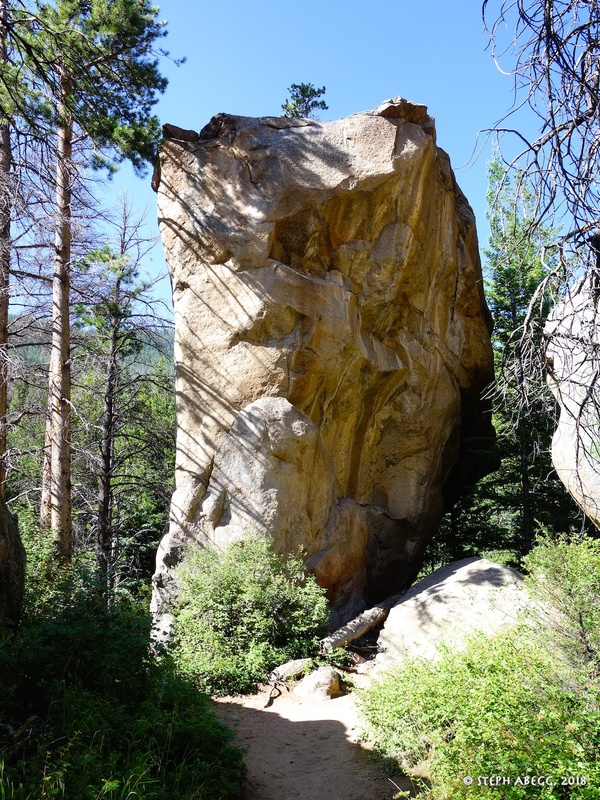 From the Fern Lake Trailhead, hike for a little over a mile, and just past the house-sized boulders on the trail, scramble up a talus field to the base of the route. About 1 hour. 1. 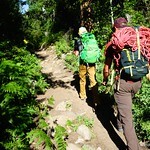 Hiking the road to the Fern Lake Trailhead (no parking spots left, on a Tuesday too!). 2. 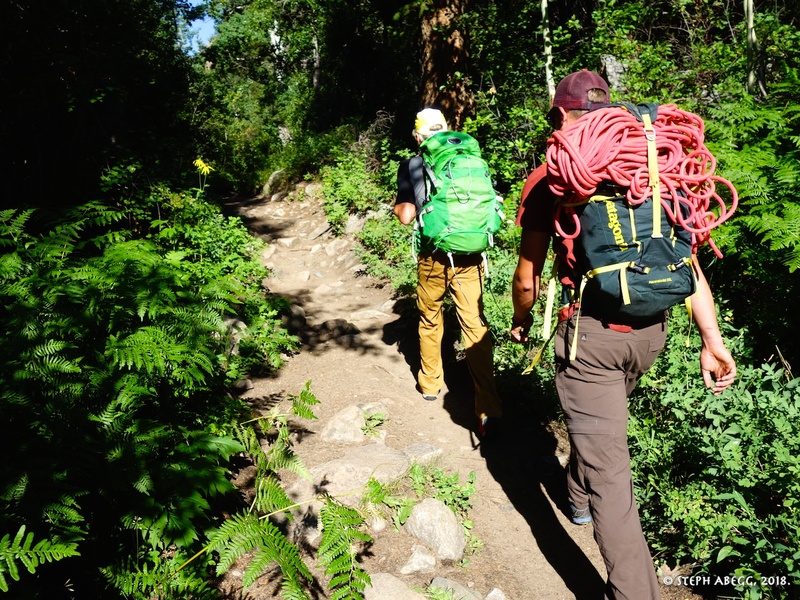 Hiking along the trail. It is flat and goes quick. 3. 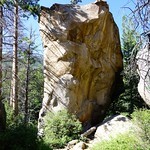 House-sized boulder on the trail. 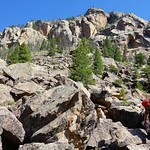 Just after this, turn right and scramble up a talus field to the base of the route. 4. The talus field. 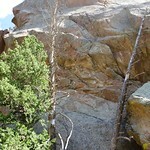 Days of Heaven climbs the left side of the rock outcrops above. 5. Looking up Days of Heaven from the base. 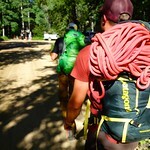 5.10a, 80'. From the top of a large detached block, pull some committing moves over the roof and climb the left-angling grove to a large ledge. 7. Dow arriving at the ledge. 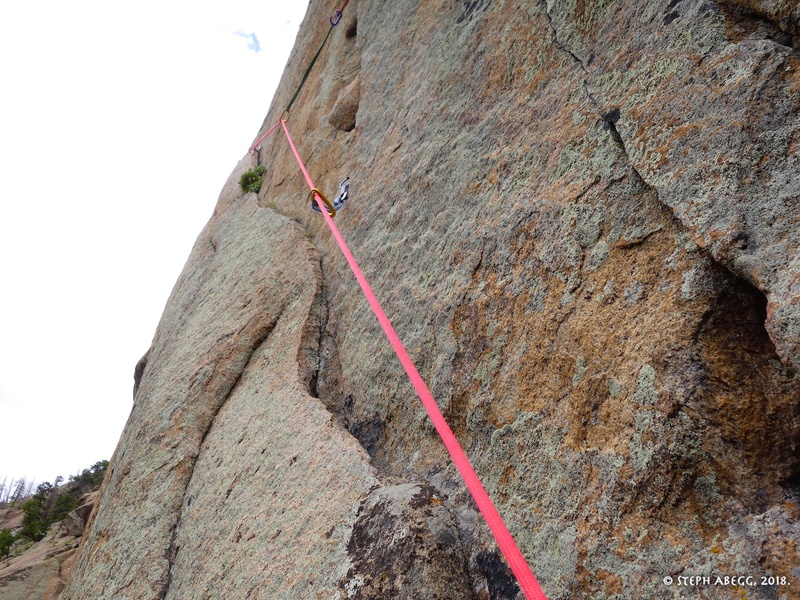 I belayed at the far left side of the ledge because I could not find great gear placements (with the cams I had left at least) at the top of Pitch 1, but I did find great gear placements on the left end of the ledge. 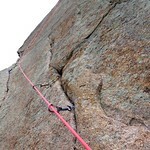 Ideally, one should belay were Dow is in the photo. 5.10c, 70'. 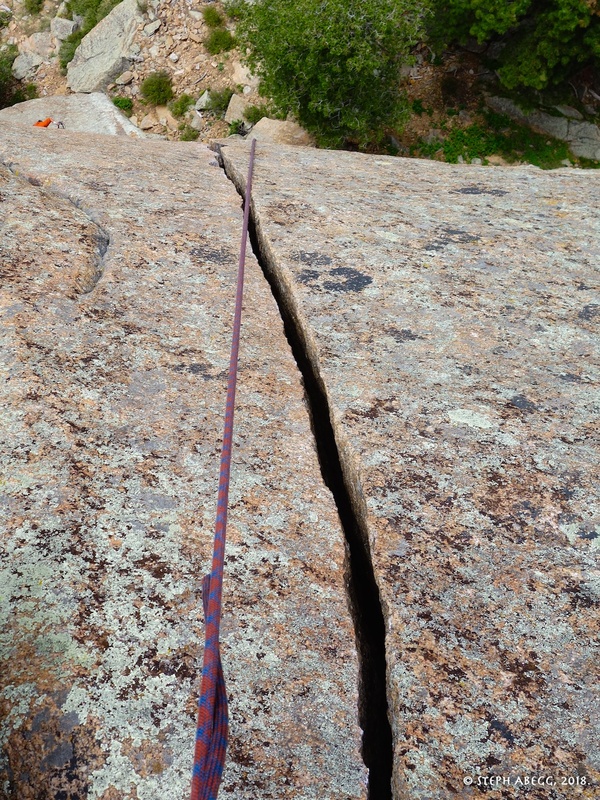 Face climb up, hand traverse left along a flake, make a wild and difficult move left to switch cracks, and climb the crack to a stance below the obvious hand-sized splitter. 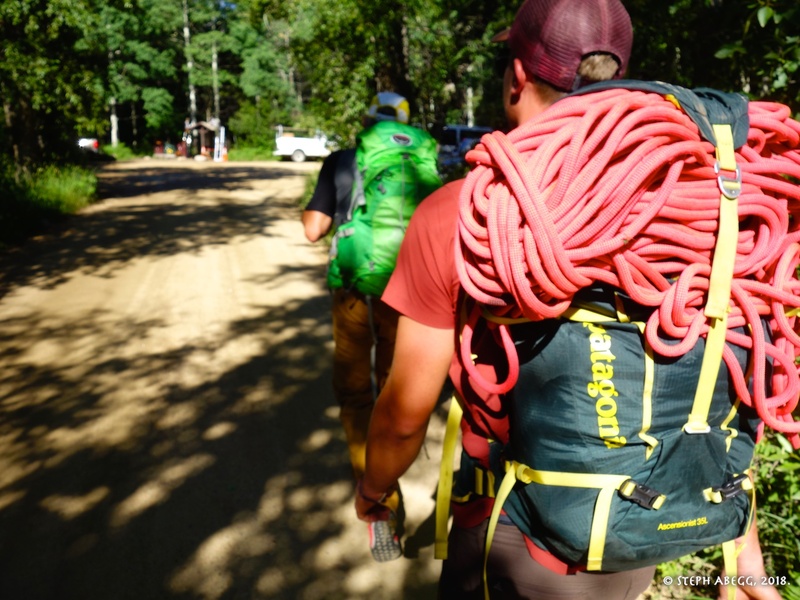 Continue on or set a belay. 8. 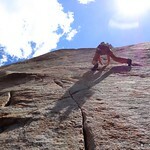 Dow doing the hand traverse on Pitch 2. 9. 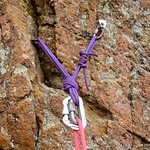 The hand traverse section on Pitch 2. 10. 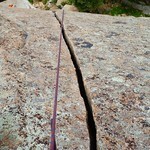 The wild and difficult move left to switch cracks. 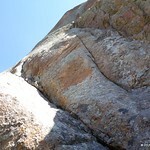 This was the crux of the route for us. 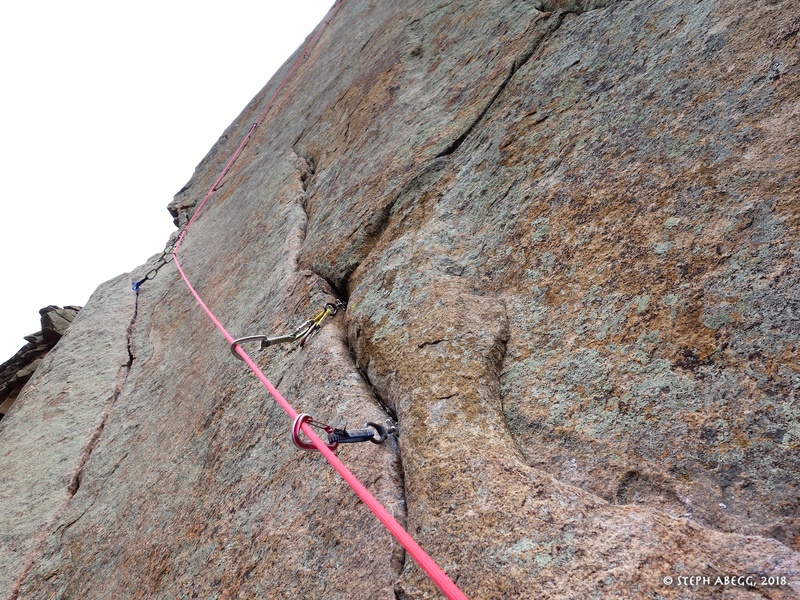 5.10d, 50'. Jam the spectacular tapering hand crack to the top of the face. 11. 11. The Pitch 3 splitter. Rap from top of Heavenly Daze with a single 70. 12. Rap anchor at the top of Heavenly Daze. For more excellent beta, see Dow's summitpost page for Days of Heaven.